Scissorhands? 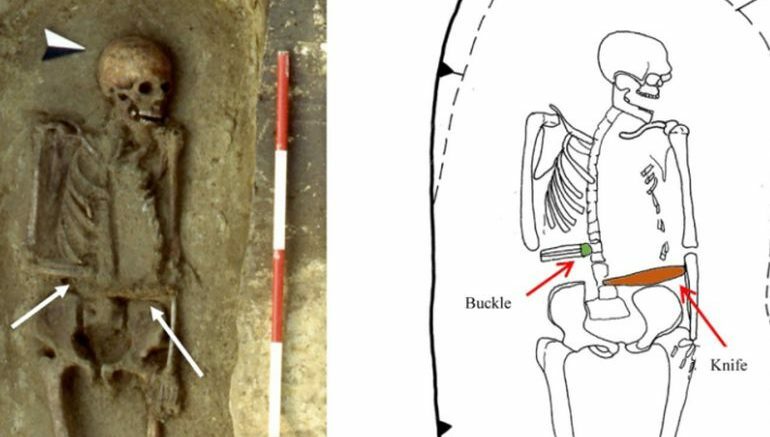 Well, as it turns out, archaeologists are baffled by the atypical remains of a presumed early medieval warrior found in the Longobard necropolis of Povegliano Veronese, in Veneto, northeastern Italy. The bewildering part relates to the person and his amputated arm that was accompanied by a buckle and a knife. Simply put, judging by the callus at the end of the ‘healed’ stump, the researchers have hypothesized that the male occupant of this grave probably used a prosthesis that boisterously combined a knife with his arm. The Longobard necropolis, as the name suggests, was a grave complex used by the Longobards (also known as Lombards), a Germanic people (descended from southern Scandinavia) who held sway over the Italian peninsula from late 6th century to late 8th century AD. Suffice it to say, the necropolis also dates from the similar time period, and as such contains the remnants of over 160 tombs and 200 people – with the latter mostly comprising Longobard males interred with weapons at their side. There are several reasons why a forearm from this cultural period might be amputated. One possibility is that the limb was amputated for medical reasons; perhaps the forelimb was broken due to an accidental fall or some other means, resulting in an unhealable fracture. The formation of bone necrosis might have led to a surgical intervention to remove the dead tissue from the healthy part of the limb…Still, given the warrior-specific culture of the Longobard people, a loss due to fighting is also possible. A third consideration for why the limb was amputated would be lost due to judicial punishment. This form of punishment did occasionally occur among the Longobard people. Now closer inspection of the amputated section has revealed callus due to the reformation of the bones at the end, along with a bone spur on the ulna. These formations hint at the biomechanical pressure that could have been caused by a prosthesis. 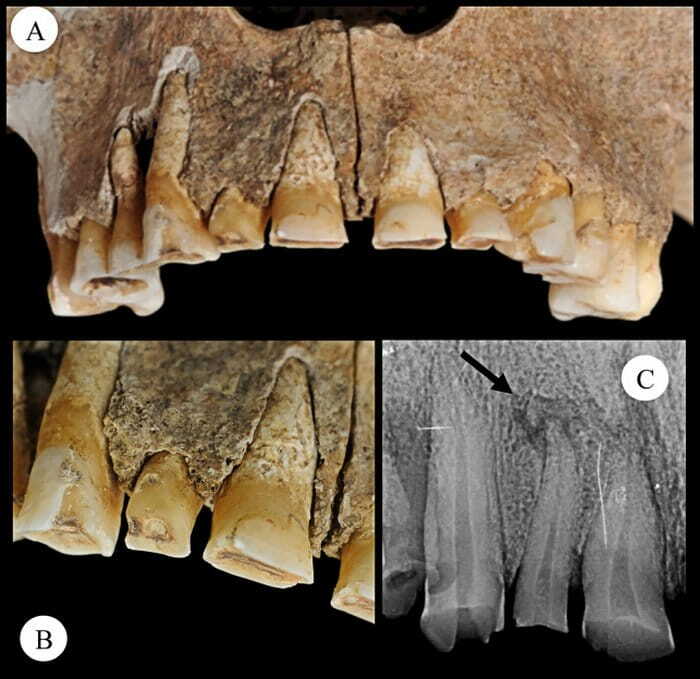 Quite intriguingly, the researchers also found evidence of such an arrangement in the unlikeliest of places – the man’s teeth. To that end, it was revealed that the right side of his mouth showed both enamel loss and a bone lesion, due to a bacterial infection perpetrated by an exposed pulp cavity. This was probably caused because the man frequently used his teeth to tighten the knife-embedded strap to his arm. Furthermore, the man’s shoulder also showcases a formation of a C-shaped ridge of bone. This was probably caused by the unnatural extended posture of the area when the subject frequently tried to tighten the strap of his ‘edgy’ prosthetics. The Longobard male shows a remarkable survival after a forelimb amputation during pre-antibiotic era. Not only did he adjust very well to his condition, he did so with the use of a culturally-derived device, along with considerable community support. The survival of this Longobard male testifies to community care, family compassion and a high value given to human life. 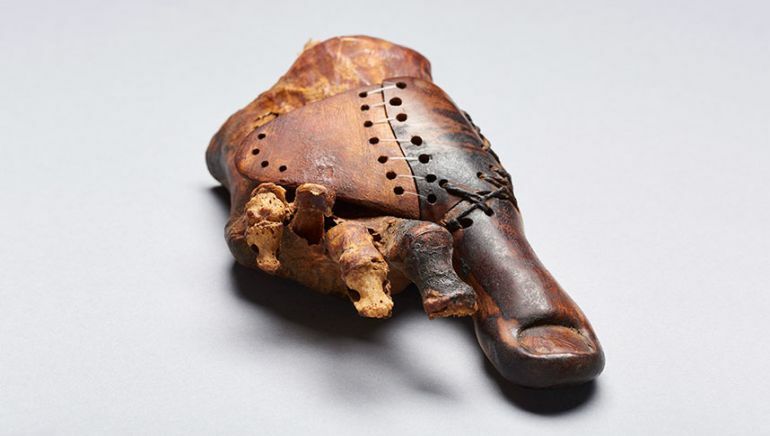 Now it should be noted that while this knife-made prosthetic arrangement was around 1,400 years old, there are far older known specimens of human prosthetics. An apt example would pertain to a 3,000-year old wooden toe (pictured above) discovered inside a female burial tomb from the necropolis of Sheikh ´Abd el-Qurna, near Luxor, Egypt. A consequent study and assessment revealed a bevy of details about the device (dating from 1st millennium BC), in essence testifying to the skills of Ancient Egyptians who were keenly aware of the finer sections of human physiognomy. The study was originally published in the Journal of Anthropological Sciences.